An Apple I computer with a homemade wooden computer case behind a display at the Southeast Vintage Computer Festival. Consumers had to build their own keyboards and monitors when they purchased an Apple I. One of the oldest personal computers in the world, the Kenbak-1, will be on display in Roswell this weekend. 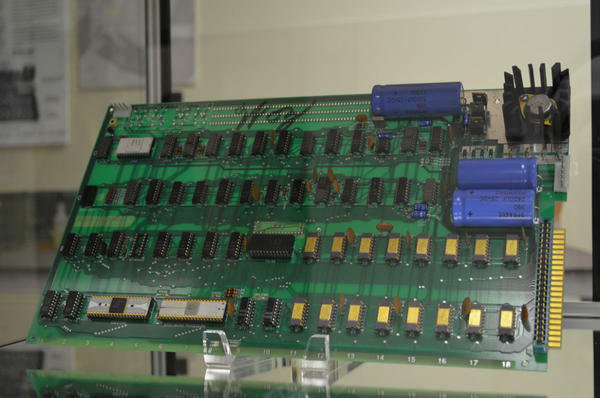 It’s part of an exhibit at the third annual Southeast Vintage Computer Festival. The PDP-8 turns 50 this year. PDP stands for Programmable Data Processor – and the PDP-8 was the first commercially successful minicomputer. It looks nothing like your modern day computer. It’s a large black box with yellow and orange switches. Earl Baugh, the secretary of the Atlanta Historical Computing Society, types instructions for the PDP on a separate machine called the teletype. The teletype looks like a typewriter, and it spits out a small strip of paper. At the festival, you can play Pac-Man, Super Pong and Mario on restored Atari, Sega and Nintendo machines and you can see the Apple One – the first Apple computer. “It brings out a lot of emotion, it’s like hearing a song that you haven’t heard in a long time or having that certain smell that reminded you of your grandmother’s breakfast cooking,” Lonnie Mims, the founder of the Computer Museum of America, says. He’s in charge of the Apple Pop-Up Exhibit at the festival. Mims says he hopes people will bring their kids so that they can see how technology evolved. The Southeast Vintage Computer Festival runs all this weekend at Kings Market Shopping Center in Roswell.